Natural Healing Tools: What is Hyaluronic Acid? Where is it in my Body???? What is Hyaluronic Acid? Where is it in my Body???? Hyaluronic Acid (HA), also known as hyaluronan or hyaluronate, is a carbohydrate, more specifically a mucopolysaccharide occurring naturally throughout the human body. It can be several thousands of sugars (carbohydrates) long. When not bound to other molecules, it binds to water giving it a stiff viscous quality similar to “Jello”. This viscous Gel is one of the most heavily researched substances in medicine today with thousands of trials mostly in the fields of orthopedics and eye surgery. 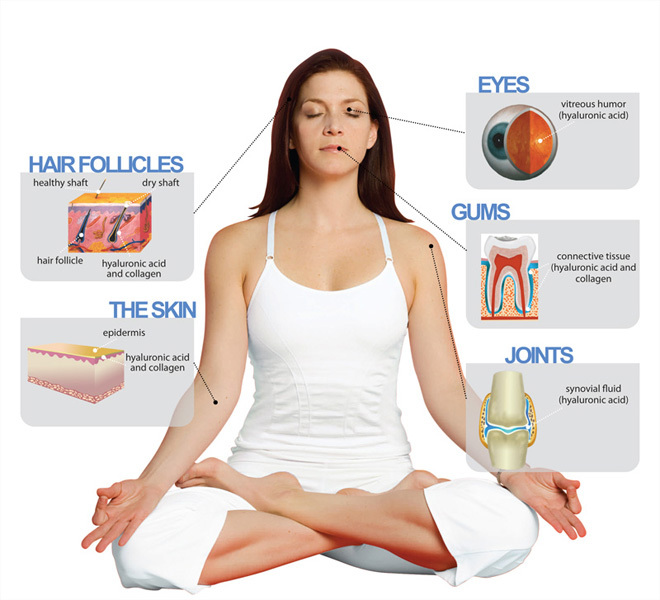 Its function in the body is, amongst other things, to bind water and to lubricate movable parts of the body, such as joints and muscles. 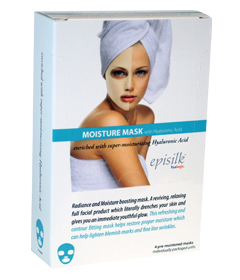 Its consistency and tissue-friendliness allows it to be beneficial in skin-care products as an excellent moisturizer. Because HA is one of the most hydrophilic (water-loving) molecules in nature with numerous benefits for the human body it can be described as "nature's moisturizer". If we compare the joints of the human body to an automobile engine, the joint fluid in the body mimics the oil in a car engine. At regular intervals we replace the oil in our car engines because the heat and friction breakdowns the oils viscosity. The oil becomes thinner and less able to protect the metal surfaces from excessive wear. Hyaluronic acid benefits our joints in the same way. As we age the viscosity of the joint fluid lessens. HA helps to maintain normal joint cushioning. What is Hyaluronic Acid's Chemical Structure? It is naturally produced in the human body and is chemically classified as a Glycosaminoglycan. In the body, hyaluronic acid always presents itself as a large high molecular weight molecule. The molecule is made up of a repetitive sequence of two modified simple sugars, one called glucuronic acid and the other N acetyl glucosamine. These compounds are both negatively charged and when put together, they repel producing an exceptionally long stretched out molecule (high molecular weight). HA molecules that are long and large in size produce a high viscosity (lubrication) effect which resists compression and allows our joints and skin to bear weight. Hyaluronic Acid is found naturally in most every cell in the body and occurs in high concentrations in specific body locations. In each body location, it serves a different function. Unfortunately, HA also has a half-life ( the time it takes for the molecule to get broken down and excreted from the body) of less than 3 days and possibly even as little as one day in the skin. For this reason, it is imperative that the body continually replenish itself with HA. Below are some of the areas in the human body where it is present and critical to anatomical function. Where Can I Get Hyaluronic Acid Supplements? At Natural Healing Tools, we carry a many forms of hyaluronic supplementation. For general supplementation, try Synthovial Seven. For the skin, there are serum formulas and lotions. Or try specific supplements for joints, eyes and throat. There is even a shampoo and conditioner!